The name Volvo was once synonymous with large and safe estates, but these days the Swedish car-maker is becoming better known for its growing range of SUVs. The enormous seven-seat XC90 set the ball rolling, and was followed by the mid-sized five-seat XC60, with the second-generation model impressing us recently. Now Volvo has turned its attention to the compact SUV sector with the launch of the XC40. Volvo has refined the SUV formula with both larger models over a number of years, and this promises to stand the XC40 in good stead as it enters what is one of the most crowded sectors of the motoring market right now, with the likes of Jaguar's E-Pace and Range Rover Evoque vying with it for attention. It would have been tempting for Volvo to simply shrink down the proportions of the handsome XC60 to fit the company's new Compact Modular Architecture (CMA) platform, but it's good to see that it's steered clear of a reiterative approach and come up with a distinctive design for the XC40. While the 'Thor's Hammer' daytime running light arrangement carries over from other models to tie the XC40 into the range, the smaller car sports a much more defined look. This includes a clamshell bonnet, concave grille, heavily sculpted doors and distinctive rear pillars, while there are also plenty of two-tone paint schemes to choose from. Climb into the XC40 and and there's nothing brash or gratuitous here, with a luxuriously clean and minimalist interior to greet you. This clutter-free look is thanks largely to Volvo using the same 9-inch Sensus touchscreen interface seen in other recent Volvos, with pretty much most of the car's major functions accessed via this central, portrait-orientated interface. The interface is your window to pretty much every element of the XC40's entertainment, convenience and safety functions, and is nice and responsive, logically laid out and, for the most part, easy to use. That said, a couple of extra physical buttons wouldn't have gone amiss here – while there's quick access to the volume, heated windscreen and heated rear screen, tweaking the climate control requires you to take your eye off the road to use an on-screen control to set the temperature, as opposed to a quick flick of a dedicated knob, although there is a voice-activated control system fitted as standard that's designed to perform such functions as changing the cabin temperature. Elsewhere though there are some clever design touches. There's enough storage space in the front doors to stow both a laptop and tablet, as the speakers that would normally be taking up space here have been shifted to an air-ventilated dash-mounted sub-woofer. The central console has a designated area for your smartphone, along with USB and 12v sockets, as well as an optional wireless charging pad. As you'd expect, there are Apple CarPlay and Android Auto options too. All XC40s feature a 12.3-inch digital instrument display, which can also relay a version of the satnav, as well as road sign info and distance alerts, while our XC40 was equipped with a high-end 13-speaker Harman Kardon sound system that delivers 600 watts. As you'd expect with a Volvo, there's no shortage of safety features in the XC40, including advanced object-detection and collision-avoidance tech. All XC40s come with the company's suite of City Safety aids, with an integrated radar and forward-facing camera to detect subjects in front of you and warn you of a potential collision; should you not react, the XC40 will automatically apply the brakes to either avoid or limit the impact. Another standard feature is Oncoming Lane Mitigation, which is designed to prevent head-on collisions, while Run-off Road Protection will automatically tighten the front seatbelts should the car inadvertently run off the road, to brace you for a potential impact. Our XC40 was also equipped with the rather handy Blind Spot Information System (part of the Intellisafe Pro pack of optional extras), which as the name suggests will warn you of anything in your blind spot. Volvo also offers a glimpse into the future of autonomous driving with the Pilot Assist. An optional extra on the XC40, this semi-autonomous technology is designed to make long motorway journeys a bit less tiring. Using the XC40's forward-facing camera and radar to detect your lane and any vehicles in front, the car will assist with steering inputs as well as maintain your desired cruising speed (up to 80mph) and take care of braking. It's a little unnerving at first, with only a couple of fingers lightly resting on the steering wheel (hands must be on the steering wheel at all times) required as the car analyses the road in front and makes the required steering inputs. You can take your foot off the accelerator, as the tech will automatically maintain the XC40 at the speed you want to travel, while you can also set how close you want to travel to the car in front, with the system slowing in line with the flow of traffic, and coming to a near-complete stop when necessary. It's very clever stuff, taking the some of the strain out of a busy commute or long drive. 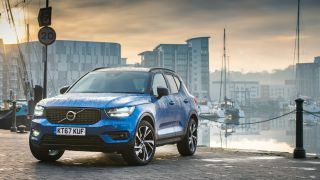 Our XC40 was powered by the range-topping T5 2.0-litre petrol engine, which produces a not-too-shabby 247bhp, but there's also the T3 (153bhp) and T4 (190bhp), and two diesel options in the shape of the D3 (150bhp) and D4 (190bhp). Depending on the model you opt for there's a 6-speed manual or 8-speed auto transmission, while there are also front or all-wheel drive options. The XC40 hasn't been designed to be thrown into tight bends on B-roads; instead it'll happily glide along most UK roads with a minimum of fuss, delivering a smooth ride, and, perhaps most importantly, it's comfortable to be in for long periods. Rather than trying mimic its compact SUV rivals, Volvo has been clever with the XC40 and come up with a brilliant alternative that offers a something a little different. Safety, practicality and comfort are everything you'd expect from the brand, but it's the attention to detail, and the Scandi-cool design inside and out, that set the XC40 apart from its rivals.